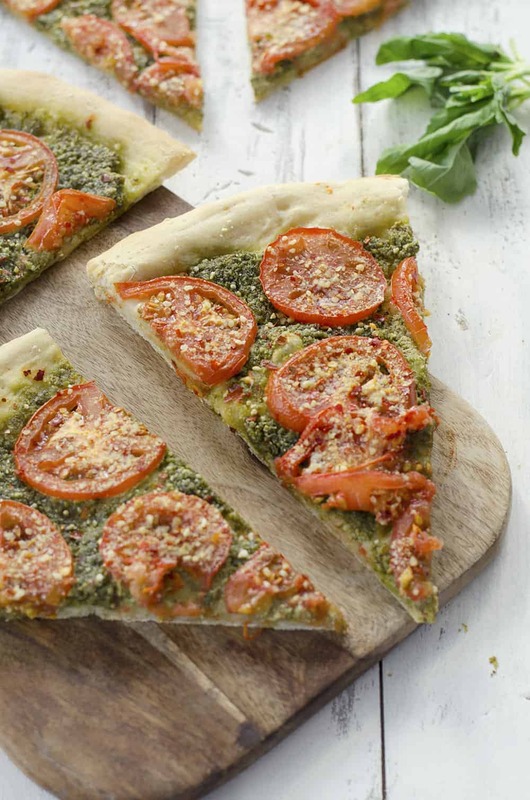 Vegan Pesto Pizza! You’ll never guess this pizza was dairy-free! 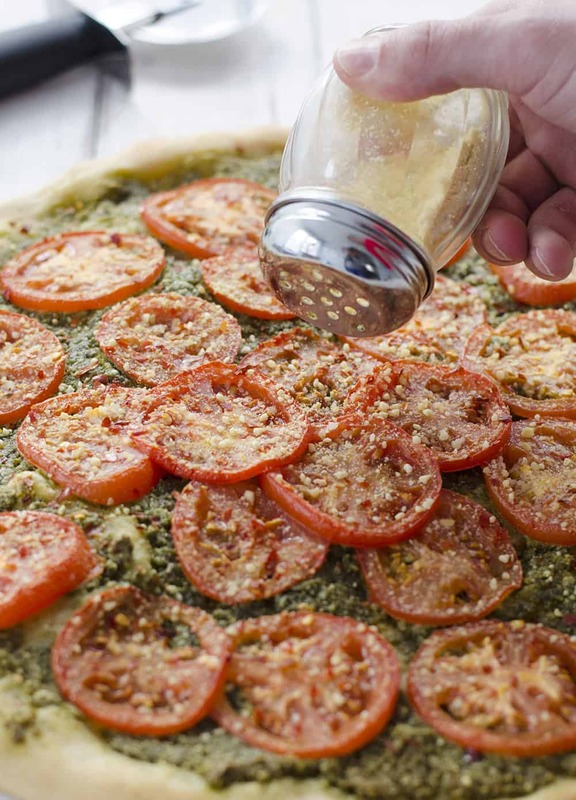 Pumpkin seed pesto topped with sliced tomatoes then roasted to perfection and topped with homemade vegan parmesan cheese! Is it pesto season yet? Pesto season = tomato season = white wine on the deck season. Clearly, this is my favorite time of year. We BL planted our spring garden a few weeks ago and I have been circling the seeded dirt like an overprotective parent ever since. C’mon little plants, rise up! Right now it’s just lettuce, basil, cilantro and mint but I am counting down the days when I can add in some tomato plants and zucchini. I so desperately want to be swimming in buckets of basil and ruby red tomatoes. But, if history proves right, I’ll be left with a few, tiny tomatoes and a basil plant that only lasts a few weeks. And a husband that says I told you so. How does everyone else do this organic gardening thing? Please tell me all of your tips and tricks. I’m also a firm believer in “if you build it, they will come.” So, this pizza. Practice for when my garden bounty finally arrives! Since perfection makes perfect, I’ve been eating this one over and over again, prepping my taste buds for basil & tomato everything that’s surely on it’s way. The coolest thing about pesto is that you don’t even need a recipe. Just a seed/nut, herb or other green, garlic and a glug or two of oil. Arugula pesto, avocado pesto, walnut pesto; proof that even without basil, pesto is still amazing. 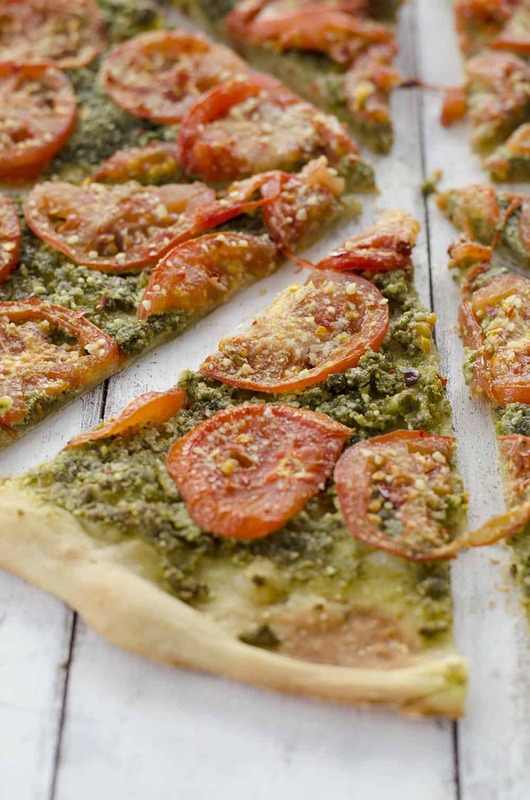 The only thing better than fresh pesto may be pizza. Let’s combine the two together! Hmm, how about some vegan pizza? Done and done. Even though I love gooey, cheesy pizza, there is something really fun about creating a vegan pizza. Almost a double-dog-dare-ya to myself. Can I make a pizza that’s just as good without the cheese? Challenge accepted, and won. 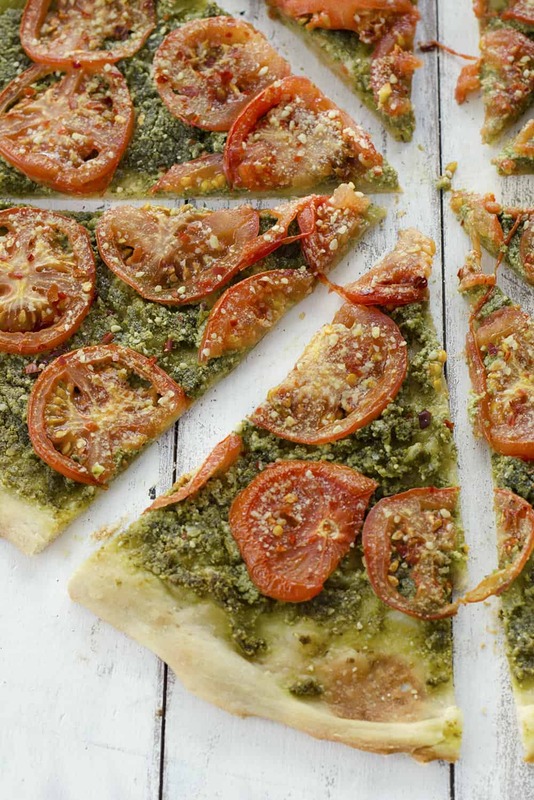 The key to this pizza is thin slices of tomatoes that caramelize on top of the pesto and a generous shake of my vegan cheese mix. Pulse the ingredients together and keep a jar of it in the freezer for whenever you need a bit of cheesy flavor. I prefer the freezer so it doesn’t go bad and can be kept in a bigger batch. But, it will also keep in the fridge for a week or so. I love this stuff! It’s my secret weapon in quite a few of the vegan recipes in my cookbook, and no one knows the difference. It taste like parmesan, but more heart healthy! One last thing to chat about- pizza dough. I live by Trader Joe’s handmade dough because it’s perfection. Sure, I could make my own and I sometimes do when I want to be extra fancy, but it’s honestly not needed. TJ’s makes the best pizza dough and it comes in three flavors: white, whole-wheat and herb. Whole-wheat is usually my favorite, but the herb one is also fantastic, especially on pizzas like this! If you don’t live near a Trader Joe’s (and for that I am really sorry), then either use a homemade crust or another brand. Check with some local pizza places, they usually have dough that they will sell! 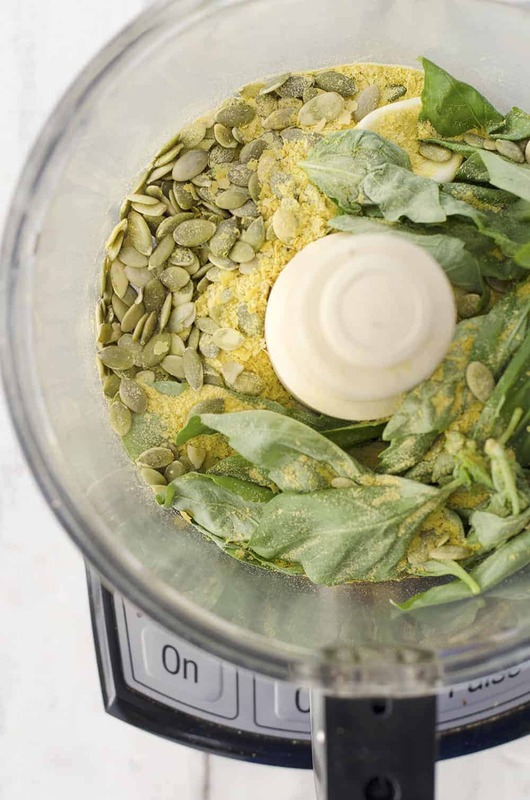 pumpkin seed pesto?! I love it! Ha! Mine either- hoping this time will be different! I lovelovelove pesto. :] This looks and sounds so good!! These photos are amazing. Yummmmm! Absolutely delicious! Made this for my husband, and the Priest of our church. They both kept saying how delicous it was. It is also very filling. Thanks Grace! So glad you liked it! Hey Alex! Planning to make this gorgeous simple pizza this weekend with an arugla salad for a dinner party on the patio. It is perfect, just what I was looking for, can’t wait to try that pesto! I am so in love with your vegan parm recipe!! Do you know if I make a bunch of this to keep on hand (parm) will it keep? If so whats the best way…fridge…pantry? Thanks!! Yes! I make a batch of it and keep the rest in a mason jar in the freezer. It’s good for 6 months (ish) in the freezer. Haven’t tried the Parmesan recipe but am going to! Is it necessary that the almonds don’t have skins? I’m ok if it’s not white like Parmesan but is there another reason to use slivers versus whole non-skinned almonds? Hi Debbie! Hope you love the parmesan recipe as much as I do 🙂 I use blanched almonds for color, but it should’t change the taste. Let me know how it works out using regular almonds! 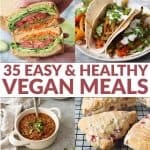 Newbie question – For the vegan parm – do I soak the raw cashews before using for this recipe? Hi Wendy! No need to soak the cashews before hand. Hi! I am looking forward to trying this recipe tonight! I was wondering if you had the nutrition facts on this recipe? 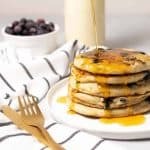 I am using MyFitnessPal and would like to be able to put it into the food diary. Thank you so much! Hi Emilee! Awesome- hope you like it! I don’t have the nutrition facts for the recipe, but you should be able to plug in the ingredients into MyFitnessPal. Just made this for dinner. It was super easy and delicious! Thank you! I hate the idea of Veganism. It’s a pain in my a**. The only reason I put up with it is because I love my wife. This recipe was probably the best thing I’ve made since she jumped on the vegan train. I give it 4 stars because it needs dairy. Hope my 2 cents counts for something.